This is the seventh in a series of articles Interest.co.nz has commissioned reviewing the key chapters and issues for New Zealand in the Trans-Pacific Partnership Agreement (TPPA). Links to all the analysis in this series are below. Governments spend a lot of money. The US government spends more money than any other organisation on the planet. Our much smaller government spends $30 billion on goods and services each year. And in our increasingly globalised world, firms from all corners of the globe are competing to win the contracts to supply governments with the goods and services they demand. How a government can advertise and award these contracts is covered under Chapter 15 of the TPPA. In a nutshell, the purpose of the chapter is to put foreign and domestic business on a level footing when competing for government contracts. It achieves this in two ways. With respect to any measure regarding covered procurement, no Party, including its procuring entities, shall treat a locally established supplier less favourably than another locally established supplier on the basis of degree of foreign affiliation or ownership. The chapter is based on the World Trade Organization (WTO) Government Procurement Agreement (GPA), which was quietly ratified here in New Zealand last August. 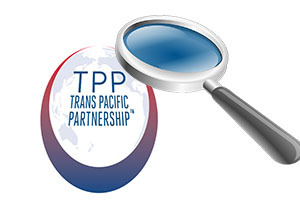 Although all twelve nations of the TPPA are WTO members, many have not yet ratified the GPA. Under the TPPA, developing countries are granted a transition period before the chapter comes into effect, which means they can still favour their domestic contractors for a limited period of time. The scope of the chapter is limited in several other ways too. Article 15.21 allows parties to maintain a preference for small and medium sized enterprises (SMEs) when awarding procurement contracts. While the Article stops short of permitting an explicit preference for domestic SMEs, it does give domestic SMEs a significant advantage by removing foreign multinationals from the pool of potential competitors. Much of the chapter is devoted to process, and it is particularly concerned with transparency. Thus while governments are free to consider a wide range of variables when awarding a contract, they must be open and transparent about their evaluation criteria when making the initial announcement. To help level the playing field, the chapter also requires the use of electronic dissemination of information – it’s no good posting the procurement notice in the local town square, and then shrugging your shoulders when you only get local applicants. Again, here in New Zealand we should not have a problem complying with these provisions. A wide range of government contracts are listed over at www.gets.govt.nz for all to see. Government procurement agreements (GPAs) are often criticised on the grounds that they prevent governments from using spending to cultivate economic growth. It is true that, like much else in the TPPA, GPAs do make it very hard for a government to pursue a long-term growth strategy based on protecting and favouring domestic industry. However, GPAs do not take fiscal stimulus off the table. They do not stop a government from spending money on domestic projects – such as the repair or development of infrastructure – that generate domestic employment. Although New Zealand has not used this kind of fiscal stimulus for a while, it continues to be used elsewhere in the world. It was the major component of the American Recovery and Reinvestment Act of 2009, for example. It is also important to remember that taxpayers are ultimately footing the bill whenever the government gets out its chequebook, and foreign suppliers may be able to provide many of the goods and services at a lower cost than domestic contractors. Cheaper is not always better, but if foreign contractors can supply than same good or service without compromising on quality, then this can ultimately leave more money in the pockets of households. GPAs also give our domestic firms a better chance to win some of the more lucrative foreign government contracts. New Zealand firms have been quietly winning government contracts from the US and Australia, and the TPPA will bring a few more potential customers into the market. Not only are the health of New Zealanders and the local environment being rapidly eroded by the NZ government and various corporations but all the factors that lead to complete extermination of most life on this planet are being rapidly exacerbated by governments and corporations. It's going to be a very 'interesting' northern summer, what with Canada and Siberia on fire and the water level in Lake Mead the lowest ever for the time of year (since the time Hoover Dam was constructed) and on track for a record low. At what point will there be a general recognition that we are headed in completely the wrong direction at an ever faster pace?